We added 20 new images to the Brady Stewart Collection Archive web site and created a new Gallery – New Images added in June 2011. The new images can be viewed at http://bradystewartphoto.photoshelter.com/gallery-list. Moving forward, I will create a new image Gallery for each month. This should make it easier to view the new imaged added each month. At the same time, I will move a copy of the new image into its related Gallery. All images in the blog are copyrighted by Brady Stewart Studio Inc. If you are interested in downloading the image or purchasing a print, please contact Brady Stewart Studio via phone (412.999.0538) or email bstewartphoto@aol.com. 1. 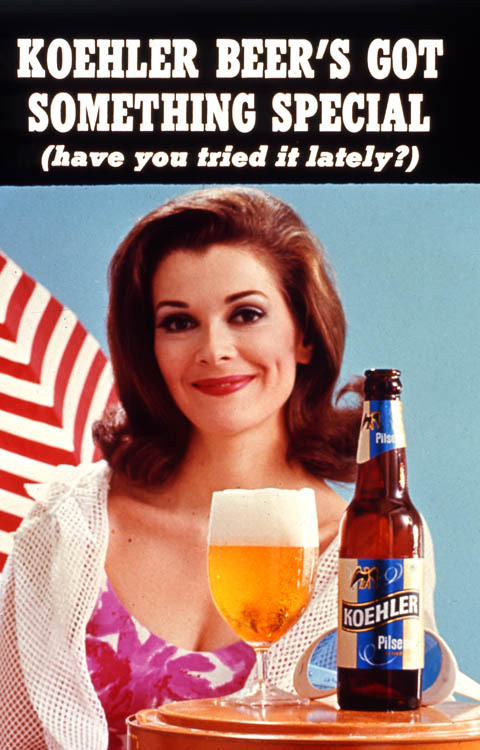 Advertising and Products: 1) 1960s Duquesne Brewery Advertisements 2) 1960s Koehler Beer Advertisements 3) 1970s DuBois Brewery Advertisements 4) 1960s Old Bushmills Advertisements. 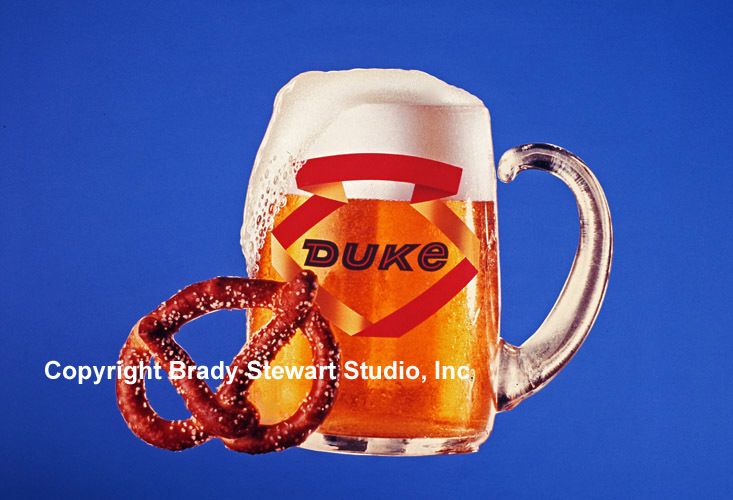 A) “Have a Duke”: The Duquesne Brewery Company was a major brand in Pittsburgh and the tri-state area for over 70 years. The Brewery opened its doors in 1899 and closed in 1972. The company went through many changes during the early 20th century due to market consolidation and the infamous government Prohibition (1920-1933). 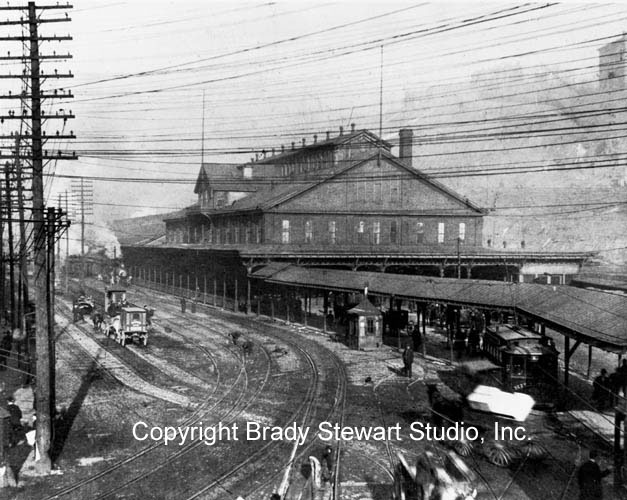 The Brewery joined the Independent Brewing Company of Pittsburgh in 1905 with 15 other local brewers. The other main competitor was the Pittsburgh Brewing Company (Iron City Beer). Duquesne Brewery was one of the few local brewers that survived Prohibition. After the end of Prohibition (1933), they became an independent brewery and developed a number of new beers which lead to Duquesne being the largest Brewery in Pittsburgh. The list of Duquesne Beers includes: 1) Frontenac Ale 1933 – 1951, 2) Old Nut Brown Ale 1934 – 1940, 3) Duquesne Beer 1934 – 1972, 4) Silver Top Beer 1934 – 1972, 5) Jumbo Beer 1935 – 1942, 6) Old Carnegie Nut Brown Ale 1935 – 1942, 7) Old German Beer 1935 – 1942, 8) Old Monastery Beer 1935 – 1942, 9) Duquesne Pilsner Beer 1935 – 1961, 10) Duke Ale 1936 – 1940, 11) Anteek Beer 1936 – 1941, 12) Silver Top Ale 1938 – 1944, 13) Sport-I-Duke Beer 1954 – 1957, 14) Duke Beer 1957 – 1972, 15) Buccaneer Beer 1960 – 1961, 16) Steeler Beer 1961 – 1962, and 17) Bavarian Beer 1961 – 1972. The brewery had three plants in the Pittsburgh area; 1) Carnegie, 2) McKees Rocks and 3) South Side of Pittsburgh. After the company expanded the operations on the South Side in 1950 (see Collection image at http://bradystewartphoto.photoshelter.com/gallery-image/Pittsburgh-Area-Businesses-that-Are-Gone/G0000Lwd.yRmewhk/I00009tP25Uk1iho), the plants in Carnegie and McKees Rocks were closed soon after. 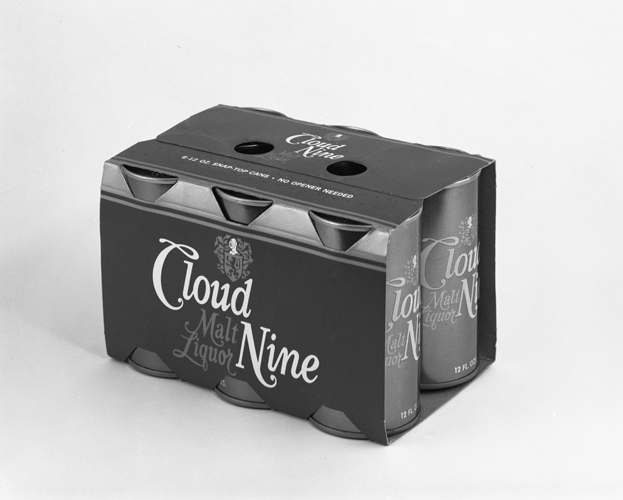 The Brewery came upon tough times in the early 60s and tried to merge with Pittsburgh Brewing but it was shot down by government due to anti-trust concerns. After a bitter stock battle between the two largest investors, the Friday Family and Raymond Sigesmund, the company ended up in the hands of Sigesmund. The new images were taken in 1965 when Lando Advertising Agency had the account. The Duquesne account was moved to Admark in the late 1966 when Sigesmund’s son-in-law, Franklyn Jeans was installed as President. Franklyn Jeans was also the President of Admark. The Brewery financial troubles continued until 1972 when the company’s assets were sold to C Schmidt and Sons of Philadelphia. 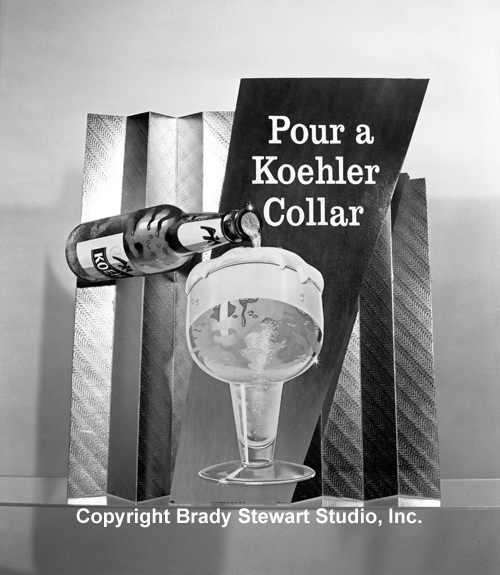 B) “Pour a Koehler Collar”: The original Erie Brewing company was founded in 1889 and closed in 1976. In 1847, Charles Koehler sold his land in Holland and sailed to America with his wife. He decided that he would become a brewer and established a small plant at 25th and Holland in Erie, Pennsylvania. He passed the brewing formula to his oldest son, Frederick, together with brother Jackson and partner A. L. Curtze and they continued the business as Fred Koehler & Co. Jackson Koehler left the firm in 1883 to buy the nearby Kalvage Brewery and both continued to operate independently until they decided to merge with the C.M. Conrad and Cascade Breweries to form the Erie Brewing Co. in 1899. 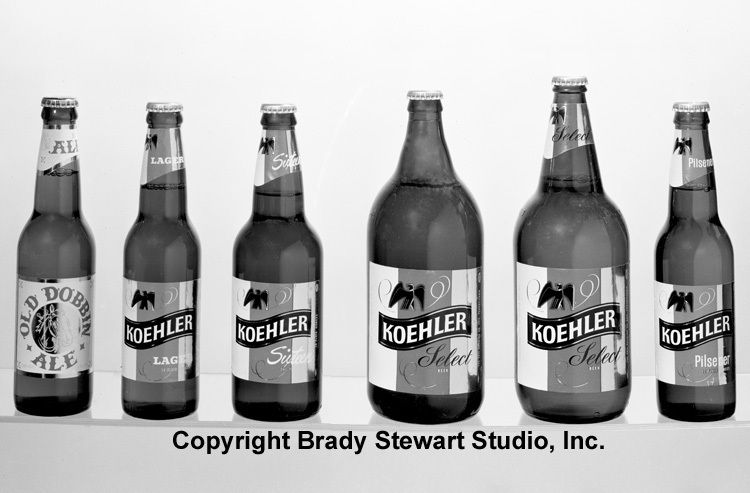 The firm was managed by descendants of Jackson Koehler until 1979 when the company was purchased by C. Schmidt & Sons, Inc.
C) Dubois Brewing Company: The DuBois Brewery was started by the Hahne family in 1897 to supply beer to a growing rural-industrial region of Pennsylvania. 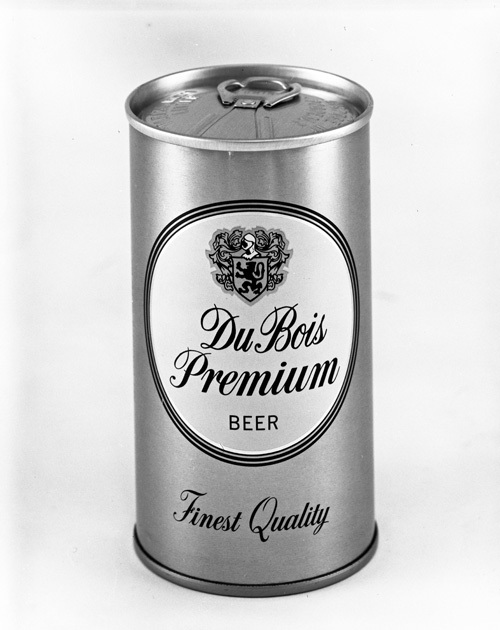 By 1906, the brewery had four products on the market, DuBois Wurzburger, Hahne’s Export Pilsner, DuBois Porter and the famous DuBois Budweiser. 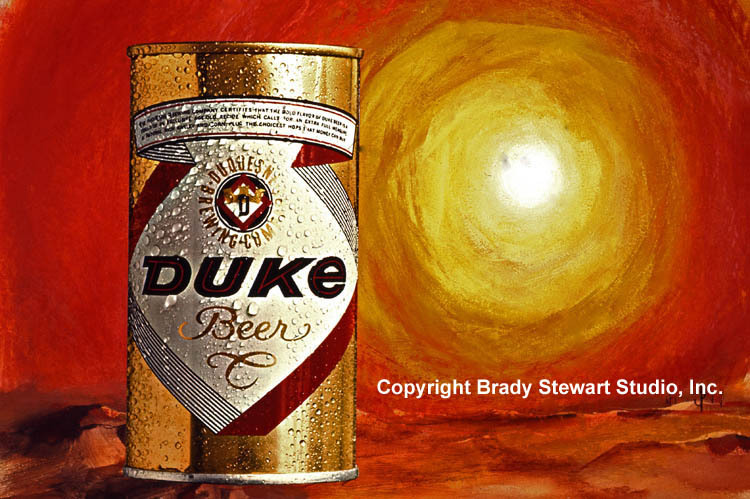 When the Anheuser-Busch Company heard that the DuBois Company was using the name “Budweiser,” they filed a lawsuit against the brewery. For over sixty years the DuBois Brewing Company defended its right to use the name “Budweiser. During Prohibition DuBois made a number of non-alcohol related products to stay in business. 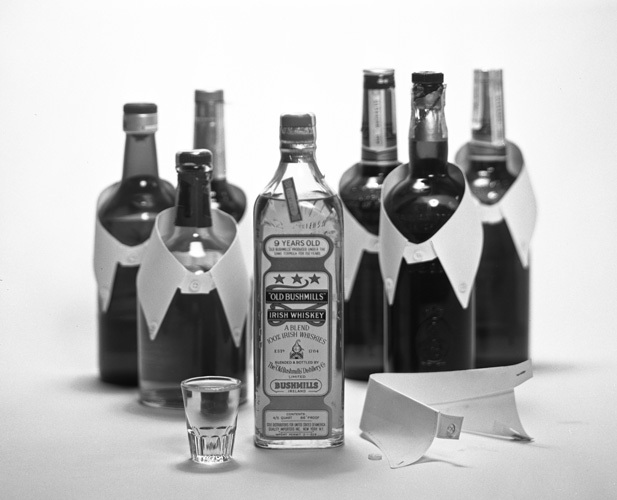 Afte r Prohibition, they continued to produce its four major products and remained successful until the 1960s. As with most of the other regional brewers, the 1960s were a decade of consolidation. J Hahne Jr sold the brewery to the Pittsburgh Brewing Company (Iron City) in 1967. The images included in the Collection were taken in the early 1970s for local advertising agency Thomas, Matelan Inc.
D) Old Bushmills Whiskey: Old Bushmills distillery is one of the oldest breweries in the world and the oldest in Ireland. The advertising was created by Lando Advertising and the studio photography completed at Brady Stewart Studio, Inc. Old Bushmills Whiskey was a favorite of Brady Stewart Jr and was also a Stewart family remedy for a bad cold. Take a shot of Bushmills with a strong cup of black coffee… cold and congestion gone! New Images were added to the http://bradystewartphoto.photoshelter.com/gallery-list on June 9th, 2011. We added 30 new images to the Brady Stewart Collection Archive web site and created a new Gallery – New Images added in June 2011. The new images can be viewed at http://bradystewartphoto.photoshelter.com/gallery-list. Moving forward, I will create a new image Gallery for each month. This should make it easier to view the new imaged added each month. At the same time, I will move a copy of the new image into its related Gallery. All images in the blog are copyrighted by Brady Stewart Studio Inc. If you are interested in downloading the image or purchasing a print, please contact Brady Stewart Studio via phone (412.999.0538) or email bstewartphoto@aol.com. 1. 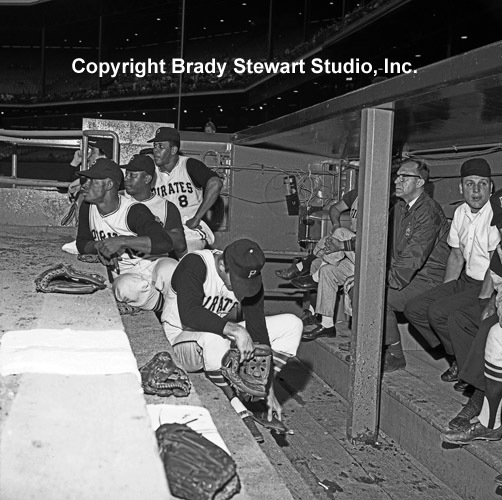 Pittsburgh Area Sports: 1) Pittsburgh Pirates and Cleveland Indians at the 1964 HYPO Charity Game. The HYPO game was played annually during the 1960s to raise money for local charities. Photo includes Willie Stargell, Manny Mota and Jim Pagliaroni (head down). Brady Stewart Jr was hired to photography the event by a local Public Relations firm, Daniell Sapp and Boorn. 2) Milwaukee Braves ace and hall-of-famer, Warren Spahn, signing an autograph. 3) Pittsburgh Pirate great and hall-of-famer, Pie Trainor, talking with local PR Executive, Walter Sapp. 2) Pittsburgh Point Photographs: 1) The Heinz Manufacturing Plant on the North Side of Pittsburgh with the Allegheny River is in the foreground. Heinz is headquartered in Pittsburgh where it began manufacturing products back in 1890. 2) Construction progress photograph of the Crosstown Boulevard project (Interstate 579) near the Civic Arena and Veteran’s Bridge. 3) Two views of point area before the start of Renaissance I and the building of Gateway Center. 4) Construction progress photograph of the Fort Duquesne Bridge ramps AKA, the Bridge to Nowhere. The bridge was originally built in the early 1960s and finally completed in 1968. 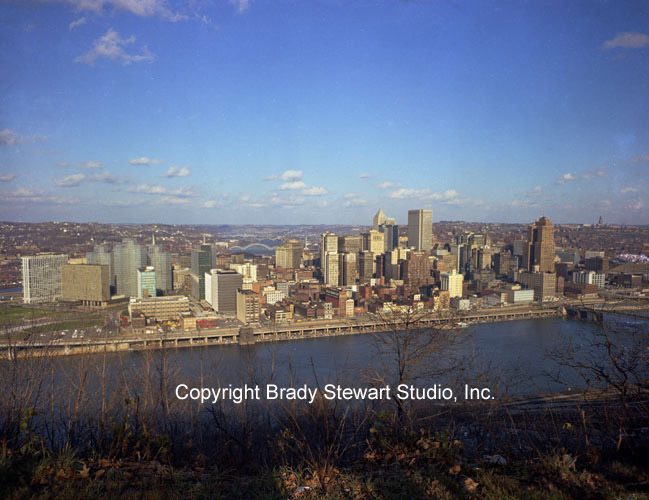 5) Three views of the Fort Pitt Bridge and Pittsburgh Hilton construction projects in 1959. 6) Two views of Pittsburgh’s annual “Light Up” night in 1960. 7) Two color views of the Golden Triangle after the completion of the new Gateway Towers (Gateway Center near the Hilton Hotel). 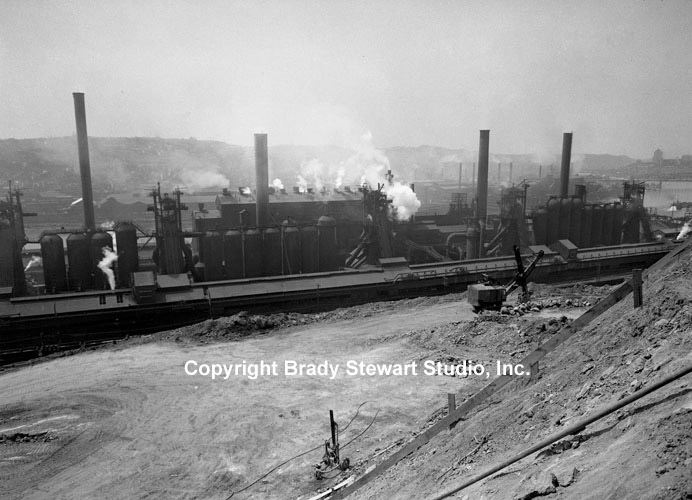 3) Western PA Steel and Coal Industries: 1) Two views of one of Pittsburgh’s largest steel plants, Jones and Laughlin South Side works. J&L began manufacturing iron in Pittsburgh at the start of the Civil War (1861). J&L started manufacturing steel and completing against Andrew Carnegie in 1886. J&L went through a number of changes over the years culminating with the acquisition by LTV Steel in 1968. LTV, who was also headquartered in Pittsburgh, operated successfully up until 2000, when it files for bankruptcy. 4) Buildings/Architecture of Pittsburgh: 1) A new view of the Civic Arena (Mellon Center). 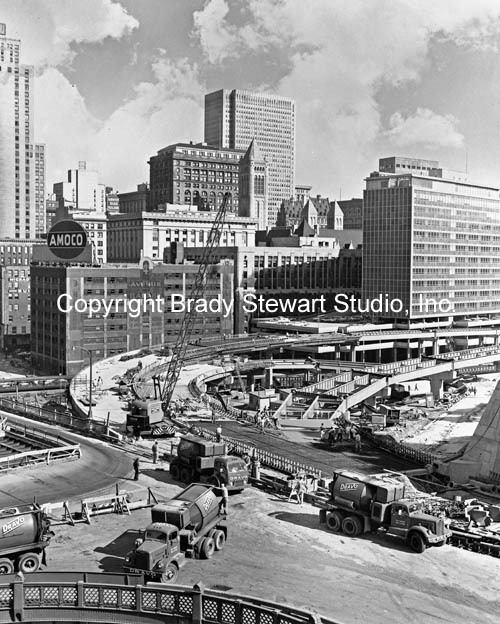 The family of Civic Arena images are the “most viewed” on the web site. 2) A new view of the Mt Lebanon High School on Cochran Road. 3) Two new views of the Fort Pitt Blockhouse near the point in Pittsburgh. The DAR, or Daughters of the American Revolution, owns the Fort Pitt Block House, which adjoins the Fort Pitt Museum. 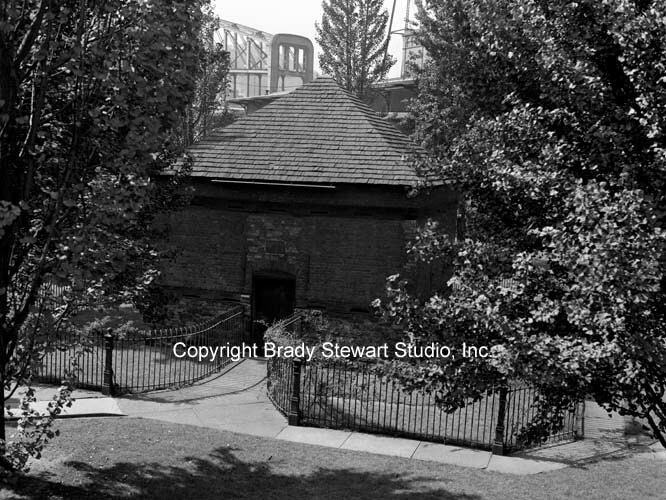 Built in 1764, it is the only surviving structure of the original Fort Pitt, and is not only the oldest building in Pittsburgh, but also the oldest west of the Allegheny Mountains. 4) View of the Greater Beneficial Credit Union building in 1959. The company has been located at the corner of Clairton Boulevard (Rt 51) and Brownsville Road for well over 50 years. 5) View of the Gamble building at 725 Liberty Avenue in Pittsburgh. Located next to Dimlings Candy on one side and the Clark Building on the other, it was located across the street from the Max Azen Fur company on Wood Street. 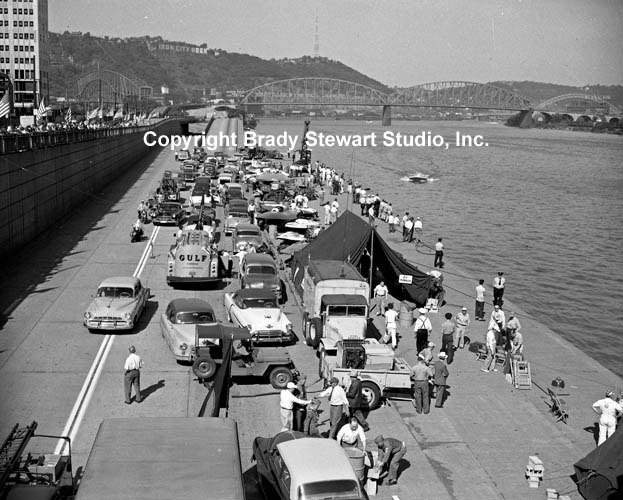 5 ) 20th Century Automobiles, Trucks and Boats: 1) The Steel Cup Boat Races were held during the 1950s on the city’s three rivers. Also known as the Welcome Week Boat Race, power boat racers risked life and limb flying up and down the Allegheny River. 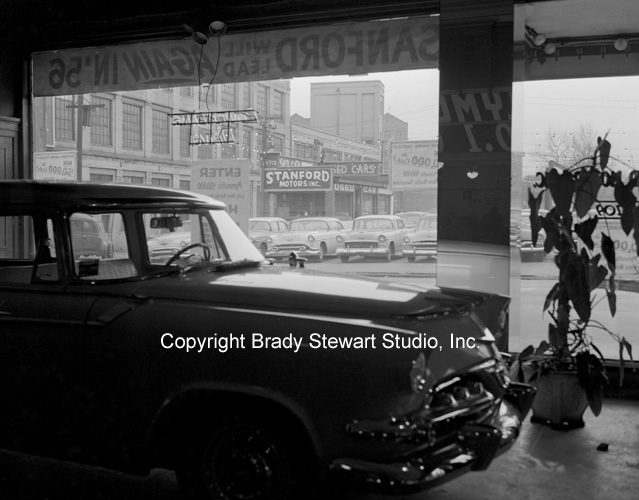 2) View of the showroom floor and used car lot of Sanford Motors in the East Liberty section of Pittsburgh. Known as auto row, Baum Boulevard, was where most people purchased automobiles during the 1950s. 6) Mid-20th Century Children (1945-1970) 1) Two images of Michael Stewart in the early 1950s. The family moved to Bethel Park from Pleasant Hills PA in 1953 right after Michael Stewart was born. The new images can be viewed at http://bradystewartphoto.photoshelter.com/gallery-list.